FDA Approved Melamine. BPA Free, safe to serve food. Perfect for mixing, serving, storing and other kitchen, outdoor picnic prep works. Top rack dishwasher safe. Not for use in the microwave or oven. Costco quality. Beyond the Amazon's A-Z protection policy, you are backed by Surpahs 100% satisfaction guaranteed program, welcome to compare. 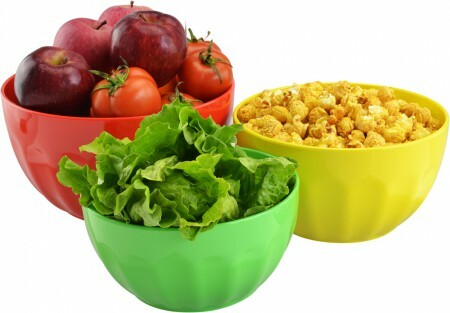 3 piece bowl set: 2 Qt, 3 Qt, 4 Qt bowls nestle inside of each other for easy storage. Perfect for mixing, serving or storing - Non-slip gasket on the bottom of each bowl provides improved grip and surface protection - Top rack dishwasher safe. However, when highly acidic foods are heated to extreme temperatures (e.g.,160 ° F or higher) . the amount of melamine that migrates out of the plastic can increase.Foods and drinks should not be heated on melamine-based dinnerware in microwave ovens. Only ceramic or other cookware which specifies that the cookware is microwave-safe should be used. The food may then be served on melamine-based tableware.